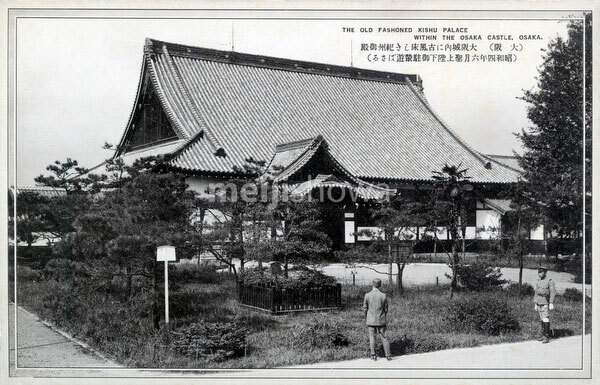 Kishu Palace (紀州御殿) inside Osaka Castle grounds in 1929 (Showa 4). The building originally was part of Wakayama Castle, but in 1885 (Meiji 18) it was dismantled, renamed Kishu Palace, and rebuilt on the grounds of Osaka Castle. Here it was used as the headquarters of the Osaka Garrison (大阪鎮台). Kishu Palace burned down in 1947 (Showa 22) while in the possession of US armed forces. Only the Japanese garden remains.